Det er onsdag, og det betyr Dream Team-tid for meg. Det er offisielt den siste dagen av sommeren i dag, i morgen er det høst. Hva er mer naturlig når sommeren er over enn å hoppe rett over til jul? Det er nemlig det jeg har gjort. It’s Wednesday, which means Dream Team time for me. Today’s officially the last day of summer, fall is coming tomorrow. What’s more natural at the end of summer than skipping straight to Christmas? That’s what I’ve done. Jeg har fargelagt motivet Sharing a Song med Copics og embosset med shabby white embossingpulver fra Stampendous, før jeg har lagt snow paint på bakken. I’ve colored Sharing a Song with Copics, before embossing with Stampendous shabby white embossing powder. When I was done I put snow paint on the ground. Utrolig nok er dette et restekort. Bortsett fra kartongen (Bazzill Java, Vanilla og Classic Smooth White) er alt av papir resteark. Her er det Maja Design, 3ndypapir, Inkido, Fancy Pants og Kreativ Hobby i skjønn harmoni. Jeg har gjort pynten enkel med chipboardsnøfnugg fra Maya Road som jeg har malt hvite og dekket med distressglitter. 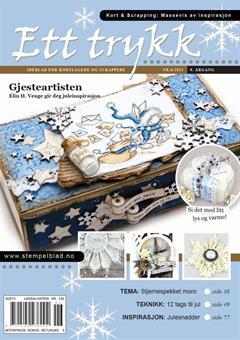 Teksten fra Norsk Stempelblad AS er stemplet med Papertrey Ink Scarlet Jewel blekk, punchet ut med en 1″ sirkelpunch og dekket med en pebble. Amazingly enough, this card is made from scraps. Aside from the cardstock (Bazzill Java, Vanilla and Classic Smooth White), every bit of paper is from my scrap pile. Maja Design, 3ndypapir, Inkido, Fancy Pants, and Kreativ Hobby are working together in harmony. I kept the embellishments simple with Maya Road chipboard snowflakes that I painted white and added distress glitter to. I stamped the Norsk Stempelblad AS sentiment using Papertrey Ink Scarlet Jewel ink, punched a 1″ circle and covered it with a pebble. Innsiden har jeg laget veldig enkel. Kun en sirkel med tekst fra North Star Design. I made the inside very simple. Just a circle with a North Star Design sentiment. Enkelt bak også, med tekst fra Kort & Godt. Simple on the back, too, with a Kort & Godt sentiment. Your card is so gorgeous! The image is so cute, the colors and your coloring are beautiful.